In 1952, the West rejected an offer by Stalin to unify the two Germanies by a national election. In response, Stalin order the German SED to implement a rapid statification of industry and collectivisation of agriculture. The resistance of farmers to this move provoked a crisis in agriculture, and there was an acute shortage of basic foodstuffs. In April 1953, shortly after the death of Stalin, East German leader Walter Ulbricht appealed for aid from the USSR. Aid was refused, but the Soviet leadership advised that in order to persuade the West not to integrate West Germany into NATO, the SED make a gesture of conciliation, returning much of the economy to private hands and cancelling price rises. The SED Politburo decided that a ten per cent increase in industrial quotas, which had already been decreed, must stay in force in order to pay for these concessions. Despite internal dissension about the wisdom of this move, Ulbricht’s decree went ahead. On 16 June, building workers at the Stalin Allee construction project went out on strike in protest. ‘But the workers interrupted him: We no longer have confidence in you. We want guarantees. The dialogue continued as follows: But I have myself been a worker for a long time - You have forgotten that. You are no longer our comrade. - How could I forget it, as a communist worker, and for so long a time? - We are the real communists, not you. ‘1. Immediate revocation of the 10 per cent increase in work norms. ‘2. Immediate reduction by 40 per cent in the price of foodstuffs and of primary consumer goods in state stores. ‘3. Leaders who committed serious errors should be dismissed; the party and the unions must be democratised. ‘4. We must not wait for the Bonn government to take the initiative for the real unification of Germany. The East German government should start immediately by eliminating all barriers separating the two Germanies. The country must be unified by secret, general and free elections and a workers’ victory must be won in these elections. A mass rally the following day was attended by thousands of metal workers and demanded the resignation of the government, some calling for its replacement by a metal workers’ government. The next day marches formed up in the suburbs of Berlin to march to the city centre. The strike had become general, closing the railways, the steel works, Leuna chemical plant, Zeiss optical works, the machine plant at Magdeburg and the Berlin electrical engineering plant. More than 250 towns were affected and the entire population was in the streets. Tens of thousands of workers tried to occupy government buildings. The red flag was torn down from the Brandenburg Gate, posters were torn down and party officials who tried to persuade workers to return to work were beaten up. At midday, the Red Army commander of the Soviet sector of Berlin declared a state of siege and two motorised divisions of Soviet forces occupied the city. Gatherings of more than three people were banned and workers were tried before special tribunals and shot. By 9pm the uprising in Berlin had been crushed. Workers’ protests followed throughout the country however. The headquarters of the Youth Movement and the prison were occupied in Leipzig. Portraits on the walls were torn down, but those of Karl Marx were pointedly spared. Similar protests took place in Meresburg, Rostock, Halle, Dresden and elsewhere, but all were put down by Soviet troops. In all 42 people were shot and 25,000 arrested in the suppression of the uprising. 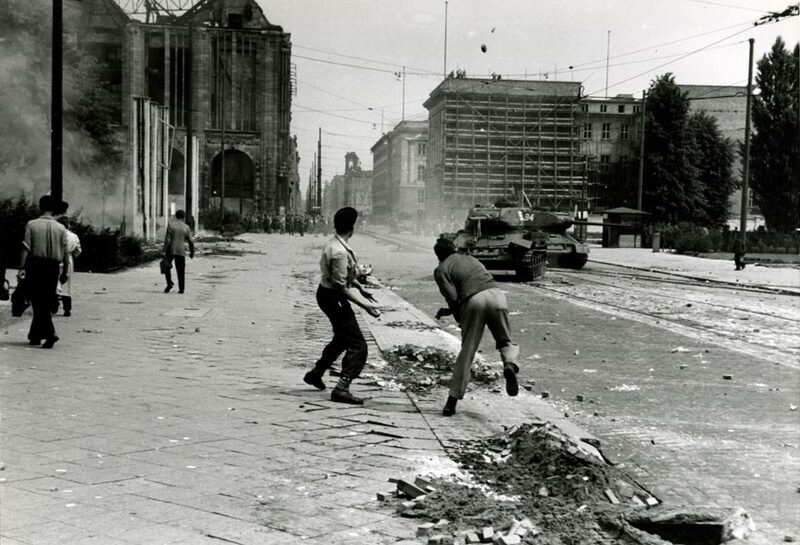 A further wave of strikes took place on July 8 and 9 in East Berlin and other industrial centres and there were sit-down strikes and go-slows. Eventually, the Soviet Union agreed to provide aid to make some concessions to the German workers, and the situation was stabilised. The Christian Democratic Union and two other bourgeois parties were brought into a ‘coalition’ government to give form to the supposed ‘people’s democracy’. The inclusion of the bourgeois parties did nothing to address the demands of workers for democracy and improved living standards of course. from A history of the People’s Democracies, Francois Fejto, 1974.
report from Pierre Gousset in L’Observateur. from The Polish August, The Self-limiting Revolution, Neal Ascherson, 1981.